This product is for thin, fine hair and is color-safe. It thickens, volumizes and softens. I have been using this product inconsistently for 18 months. The product is supposed to help thicken hair. I have not seen that happen, HOWEVER, this is the perfect moisturizer for fine thin hair. It is absolutely amazing! I love the low pH, which is perfect because it is within the range that hair pH (4.5 to 5.5) is. I always have curly detangled ends because of the low pH. I have studied my hair long enough to know that it does well with products that have a low pH. 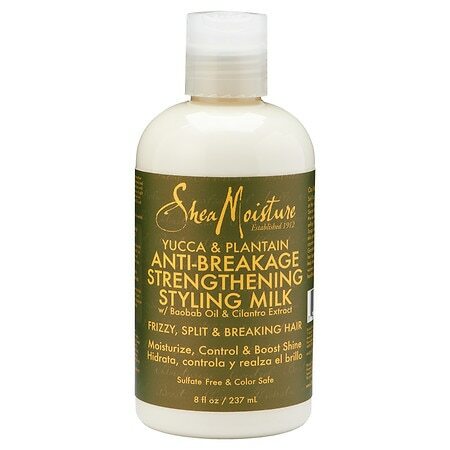 My hair stays moisturized and baby soft for days when I use this product. This product has Vegetable Glycerin in it, so be mindful of that, if that ingredient dries out your hair during the winter. My hair loves glycerin all year round. This product, also does not wear my hair down as I do not have a lot of hair to begin with. I use it as a leave-in/moisturizer after washing my hair. I really do not need to seal with oil and do not. I use this product more when my hair is not in extensions, but recently, I started adding a little bit to my home-made sprays and the mixture is absolutely amazing, keeping my hair soft and moisturized in extensions. I also noticed that this product keeps breakage in check. My hair is fragile and when something is wrong with my moisture/protein balance or something (whatever that is..LOL), I see little short coils on my fingers when I touch my hair. They are usually not a lot but I should not be having any breakage at all. However, this product is like medicine for my hair. I also love the fact that it is multi-functional, as it conditions, moisturizes and can be used as a styler. However, It does not provide any hold. I highly recommend this product for those with fine hair. You may give it a try to see it if it can help thicken your hair. Some people have claimed to have seen such results with the use of this product. Like I said, I have not used it consistently for the past 18 months, for no reason. I really love this product and plan to keep using it consistently. My next review will be on the Deep Treatment Masque from the same company but for Fine/Thin Hair, so please stay tuned for that. I also did a review on both . . . I loved the deep conditioner but not the "thickener" so much. I can't wait to read your review on the deep conditioner. You did.. I am going to check out your reviews. I love the deep conditioner. I feel like I need to get the word out on that deep conditioner. It is amazing! I saw the shampoo and I was going to purchase it, but passed. I bought the regular Shea moisture shampoo and moisturizing conditioner. I was not drawn to the shampoo as well, especially since their Moisture Rentention Shampoo works great.